Converted from farm buildings that once served the hall and dating back to 1685, these detached, holiday cottages retain much of the original character with exposed beams and stonework. The cottages offer space and character in a delightful courtyard setting. Birdforth Hall Cottages have shared use of superb leisure facilities which include an indoor heated swimming pool, fitness room and an additional area in which to sit and relax. A perfect base from which to explore the diversity of North Yorkshire. The historic city of York, 16 miles, offers a wealth of attractions with its minster, castle and railway museums, Jorvik Viking Centre, city walls, river cruises and ghost walks. The cathedral city of Ripon, 17 miles, is the gateway to the Yorkshire Dales. The North Yorkshire Moors Steam Railway offers a relaxing ride through the stunning moorland and forest of Heartbeatcountry, leading to the Heritage coastline where abbey ruins stand high above the bustling harbour at Whitby, Smugglers’ Coves can be found in Staithes and Robin Hood’s Bay. The 18th-century house at Castle Howard, National Trust Beningbrough Hall with its National Portrait Gallery and the World Heritage site of Fountains Abbey, provide excellent days out. The World of James Herriot can be found in Thirsk, and Flamingo Land and Lightwater Valley provide fun for all the family. Horse racing at York, Thirsk and Ripon. Both properties (25720 and 25721) can be booked together to sleep 16+4. Shops 4 miles, pubs 2 miles, restaurant ¼ mile. Both properties: Oil central heating included (by meter reading May-Sep). Electric, bed linen and towels included. Cot. High-chair. DVD. Electric cooker. Microwave. Washing machine. Dish washer. Fridge/Freezer. Courtyard with sitting-out area and furniture. Ample parking. Shared indoor heatedswimming pool (9.5m x ?m, depth 1.2m to ?m, closed Fridays) with shower/changing facilities and leisure room. Fitness equipment. No smoking. Holidays run from Friday to Friday.NB: Water feature in garden. Ground floor: Living room. Dining room/kitchen with tiled floor. Separate toilet. First floor: 4 bedrooms: 2 double, (one 5ft), both with en-suite bathroom with bath, shower cubicle and toilet, 1 twin, 1 bunk with additional single. Bathroom with bath, shower cubicle and toilet. For a better idea of where Birdforth Hall Cottages - The Granary is, you can see Birdforth Hall Cottages - The Granary on the map below. 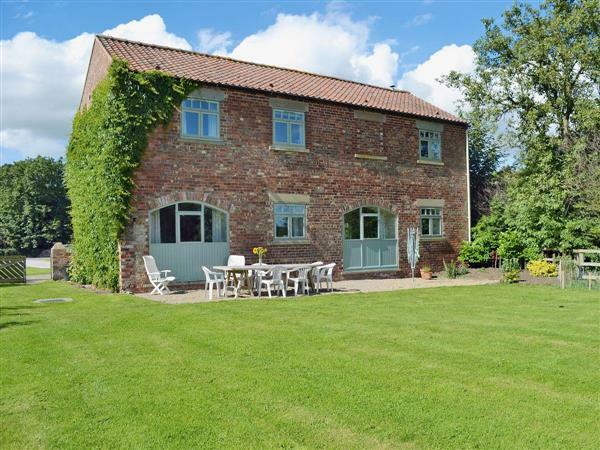 Birdforth Hall Cottages - The Granary is in North Yorkshire; should you be on the lookout for a special offer, you can find all the special offers in North Yorkshire. It's always worth checking to see what is on offer at the moment. Do you want to holiday near Birdforth Hall Cottages - The Granary (25721), you can see other cottages within 25 miles of Birdforth Hall Cottages - The Granary; have a look to find your perfect holiday location.